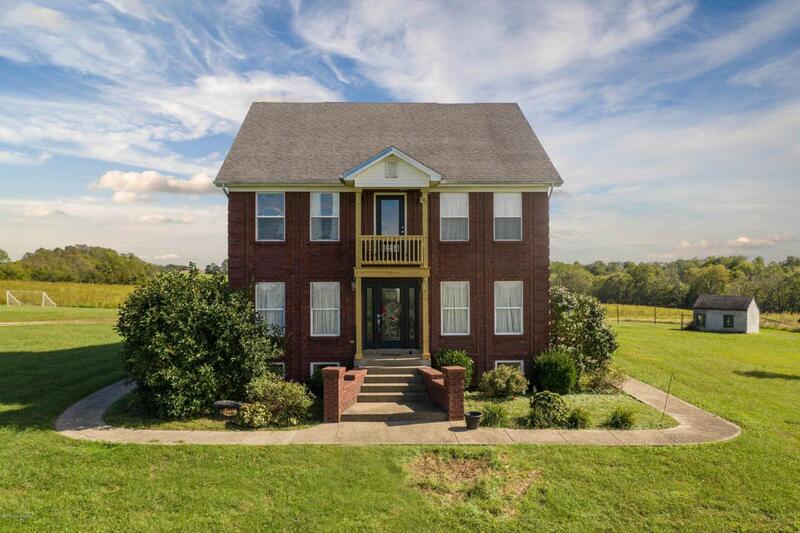 Take a drive to the country and view this one owner majestic gem of a home perched on top of an 11.28 acre farm. Come experience Southern Charm in this Georgian Colonial with modern amenities and finishes. This move in ready home offers 4 bedroom, 3 1/2 baths with 2435 sq. ft. of finished living space along with an unfinished basement. Entering this home through the grand front entry with leaded glass door will make a stunning first impression! This home features a gas fireplace never used, custom cabinetry and beautiful hardwood floors. The Eat-in Kitchen is a cook's dream with lots of cabinets, recessed lighting, smooth cooktop, and large island with storage. The formal dining room is perfect for family gatherings.On the main floor you will find a formal living room along with a family room. Retreat to the luxurious second floor Master Suite, his and hers closets, space for a sitting area and access to the balcony. Then, relax in the spa-like Master bath w/ double sink vanity, stand up shower, and separate Jacuzzi tub. The balcony gives breathtaking views and indescribable peace. You must experience it. The upstairs also offers an additional 3 large bedrooms and full bath. One of the bedrooms is currently being used as an office. Descend to the full basement from the kitchen where you will find a convenient full bath and huge laundry room. Keep the party going outside on the back patio areas offering plenty of outdoor living space and breathtaking views of the scenic countryside. The English Cottage playhouse/potting shed is an added bonus along with the detached garage with lean-to. A small pond sits at the front of the home. The possibilities are endless here. Could be a wonderful place for horses or any other livestock or animals you may have or want. The views, peace, quiet, and the wildlife on this property make this country living at its finest. Seller is offering a 1 year HMS Home Warranty with an acceptable offer. This Picture-Perfect property is stylish, functional and offers exceptional quality. Schedule your showing today! Please note that currently there are crops on part of the 11.28 acres in which will be harvested and gone by the first of the year at the latest.